This Russian family has a pet fishing cat. To keep it entertained and obviously well-fed, they allow it to catch catfish in the bathtub and pluck whole chickens in the living room. Judging from the pics, I don’t think you really want one. Fishing for a catfish in the tub. Dragging the kill across the floor. Not making any mess at all! 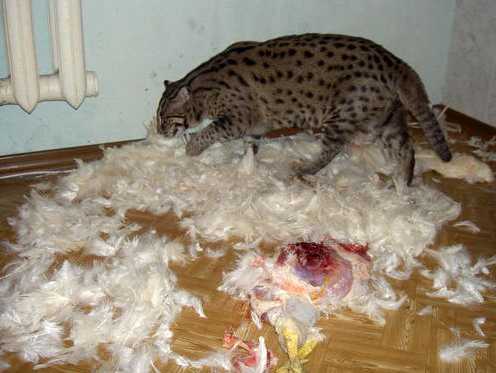 Fishing cats don't eat feathers. Fishing cats belong to the leopard cat genus, Prionailurus. Although their size varies greatly, they are often significantly larger than leopard cats, and they are much more specialized. They live almost exclusively on fish, which they catch out of rivers and mangrove swamps. These cats are distributed in disjointed populations throughout South and Southeast Asia, including Sri Lanka. The IUCN considers this species endangered. One would hope that this particular specimen belonged to zoo that was engaged in propagating the species. Perhaps it does belong to such an institution, but it was hand-reared and is just visiting its raiser’s home again. But this is Russia, and just about anything can be purchased for the right price. Very few fishing cats exist in captivity, and in European zoos that are involved in the species survival plan, the entire population of breeding fishing cats derive from twelve unrelated individuals. These cats are not particularly easy to breed in captivity. 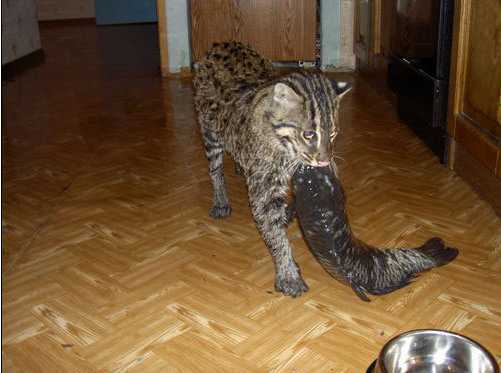 Like clouded leopards, male fishing cats can be quite aggressive towards females when they are first introduced. 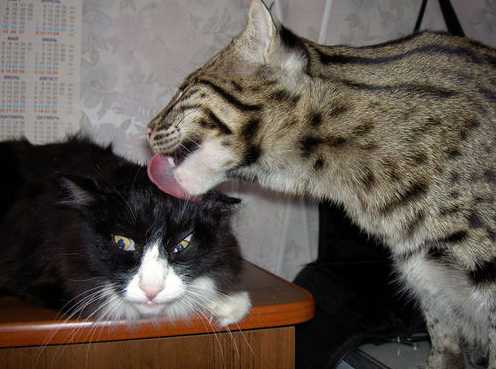 I remember seeing a show that featured a zoo putting spending weeks and weeks allowing a male and female fishing cat to become acquainted with each other only to have the male kill the female in the end. 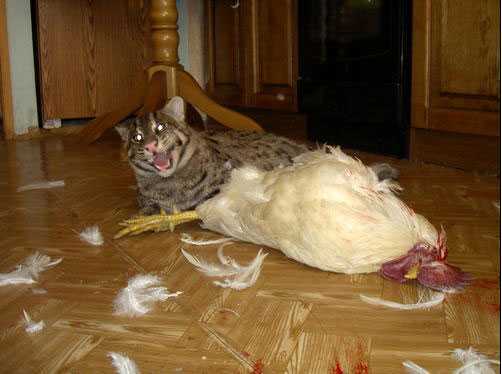 If this animal is a pet, I’d be worried about the safety of that domestic cat. The two species likely can hybridize. 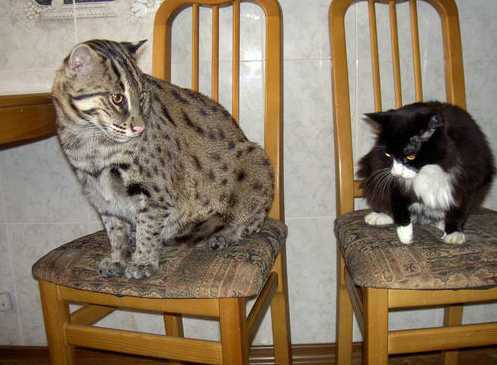 The domestic cat and the leopard cat are commonly crossbred in captivity, and the fishing cat is not that distantly related to the leopard cat. But the aggression that male fishing cats exhibit and their relative rarity in captivity precludes the possibility of anyone breeding aquatic Bengals. The truth is that the fishing cat is in trouble in the wild, and the captive population has real issues with genetic diversity. Every captive individual has valuable genes. So although these photos are amazing, one should be concerned about ethics of keeping such a valuable animal as a pet. I caught only one. My uncle got three, but they were put in the freezer before I could get photos of them. on April 12, 2012 at 7:33 pm M.R.S. It could be just a trick of the photography, but that cat’s tail looks more like an otter’s than like most cats’. Perhaps an adaptation for swimming? Maybe an adaptation to avoid being grabbed by a large fish. A cat’s twitching tail might look good to a fish. Thank you for this informative, interesting post. 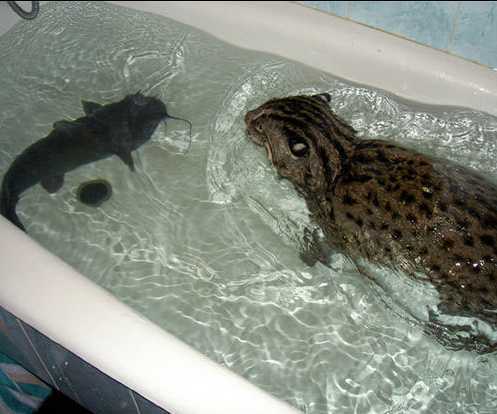 I had never heard of fishing cats. I hope they aren’t ultimately doomed as you seem to imply. Sylvester looks a bit uncomfortable, which serves him right after what he did to poor Tweety bird. I saw a pair of clouded leopards at a public zoo. Litter bro & sis, ca 5mo. Now I’ve watched my share of puppies and kittens, but these guys played rough. Very rough. The male was at that age just a bit bigger than the female, so she was ok for the time being…. I can’t help wondering whether they kill each other in nature or whether they do it in captivity just because they can’t escape from one another. Maybe if they had several acres to lose each other in they’d get along better. Also must wonder who is draining the mangrove and why. So shoot me, but I think that’s an important question, one that dwarfs the question whether some guy in Russia should have a pet. We can’t count on zoo populations forever because no matter how careful we are, in-breeding depression will set in sometime. On the zoo babies site there are some fishing cat babies.